Charles University in Prague uses the European Credit Transfer and Accumulation System (ECTS) which is a workload-based system for measuring and comparing study results. 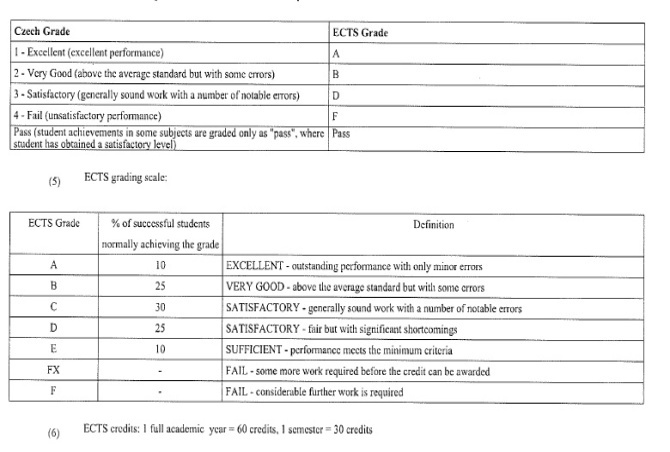 The student is awarded a certain number of ECTS credits for each course which reflects the workload necessary to successfully complete a course. Credits are awarded only when the student has fulfilled the course requirements, for example regular attendance. The credits are allocated by the individual departments in accordance with the standard workload determined by the respective study and examination regulations whereby one credit equals 30 hours of study.